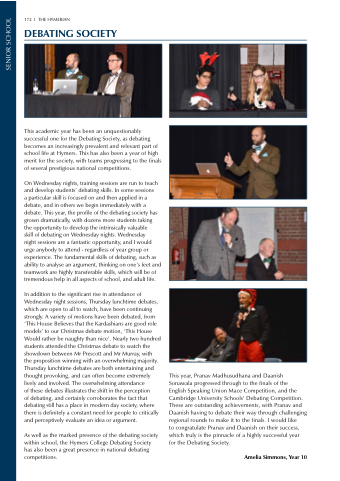 This academic year has been an unquestionably successful one for the Debating Society, as debating becomes an increasingly prevalent and relevant part of school life at Hymers. This has also been a year of high merit for the society, with teams progressing to the finals of several prestigious national competitions. night sessions are a fantastic opportunity, and I would urge anybody to attend - regardless of year group or experience. The fundamental skills of debating, such as ability to analyse an argument, thinking on one’s feet and teamwork are highly transferable skills, which will be of tremendous help in all aspects of school, and adult life. of debating, and certainly corroborates the fact that debating still has a place in modern day society, where there is definitely a constant need for people to critically and perceptively evaluate an idea or argument. As well as the marked presence of the debating society within school, the Hymers College Debating Society has also been a great presence in national debating competitions. to congratulate Pranav and Daanish on their success, which truly is the pinnacle of a highly successful year for the Debating Society.